Can I Drink Coffee if I Have Strep Throat? When you have strep throat, you can blame the Streptococcus bacteria. In addition to a sore, aching throat, these harmful bacteria can lead to symptoms such as nausea, chills, loss of appetite and headaches. When you're sick, you may wonder if you can continue your once-, twice- or three-times-a-day coffee habit. The answer is yes, if your aching throat can tolerate the warmth. Always check with your physician first, however, concerning the best foods and drinks for you while you have strep. If you need your caffeine fix and your throat feels as if it is burning, you can relieve your throat soreness by drinking an iced coffee. Because your throat may feel swollen due to strep, the cold temperature can help to constrict your swollen blood vessels. Other liquids you may be able to tolerate include milkshakes, soups, tea and carbonated drinks. Drinking as many fluids as possible can help to prevent dehydration, which can make you feel even worse when you are already ill.
Another side effect from strep throat is a dry, scratchy throat. When this is the case, you may wish to avoid foods and drinks that can make your throat feel even drier. Caffeine-containing beverages, such as coffee, tea and soda, can dry out your mouth. You may want to try drinking a small amount of coffee to see if your throat feels dry after drinking it. Because each person's symptoms vary with strep throat, you may find coffee does not cause your throat to feel dry. Additionally, caffeine increases the likelihood you will become dehydrated because it is a natural diuretic. For this reason, you may wish to limit your coffee intake to one to two cups. Because strep throat can cause fever, you may feel hot and sweaty as a result. 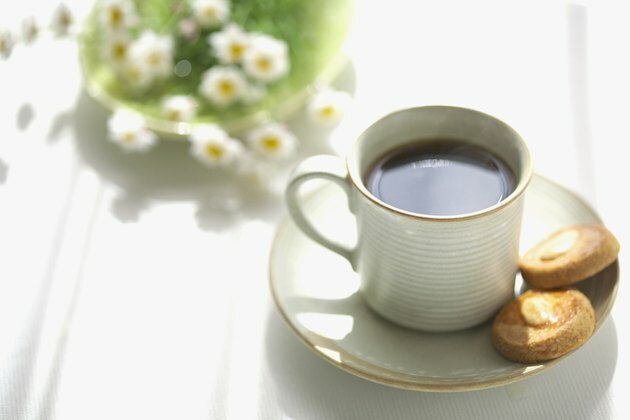 When you are experiencing a fever, coffee's hot temperature may make you feel even hotter. If you are taking antibiotics, your fever symptoms should improve within two to three days. You may find drinking coffee more appropriate when your fever has subsided. If you find coffee too drying for your throat when you have strep throat, you may wish to try drinking tea with lemon and/or honey. These teas have soothing properties and typically less caffeine than a cup of coffee. You also can gargle with warm saltwater to soothe your throat: Mix 1 cup of water with 1/2 teaspoon of salt. By doing this several times per day, you can relieve your sore throat.